I’d moved into Ulverston in March 2010, and immediately started Parish training in the southern Lakes, walking into work, exploring the fells and lakes, (I say exploring, others had already done it, I was just checking on their exploring) and making progress in my fitness. 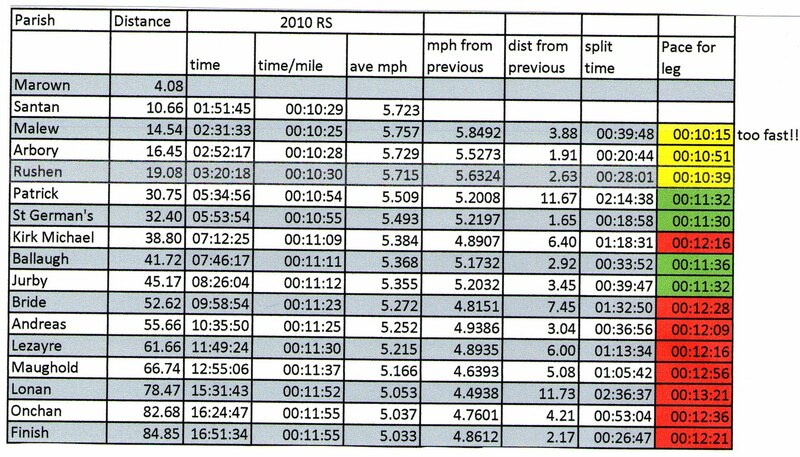 When I put my entry in I was being realistic in looking for a sub 17hr time, which would most likely get a top ten finish. 17 hours is a landmark type target because it’s average 5mph, an impressive overall speed. Hopefully Pauline had already gained some experience from 2009 when she was taken by surprise in finding it wasn’t stopping for picnics and pleasant ambling in the Manx countryside, and had planned motivation rather than catch up. I was resting the couple of days prior to the race, full of self-doubt as usual, lying on Helen’s sofa watching telly when I turned over to get more comfortable and felt something go in my back. More self-doubt, more anxiety as I’d already had my massage from Dawne, she was busy and couldn’t fit me in at late notice. I’d already had worries about my groin on the left side, my feet were blistered during the Bradford a month earlier, and although healed, it was fresh healing so cause to worry. So, physically, I was in an ever decreasing spiral of niggly pain. Saturday morning was a quick breakfast whilst making the first round of soups and tea’s in flasks. As Helen and Pauline live in Peel, it’s very handy for topping up mid afternoon as we pass through. Some drinks can stay in the fridge to be plucked cold for mid afternoon use, and hot flasks can be topped up. We set off for the start, loud rock music in the car, sing along, helps nerves and builds adrenaline, and then the panic attack at 7.20, passing Union Mills, I turned to Pauline. “My dibber.” I’d put all my gear in a bag ready for changing, gone to the bathroom, taken everything out and left it on the sink by the taps. Possibly the worst thing to forget, thinking about it. We arrived with ten minutes to spare, and I worked my way into the crowd at the start line. Thanks to the kind people who saw my low number and ushered me to the front, I got a good starting position. Being at the front unfortunately meant that when I started to “rearrange the furniture down below” in preparation for the long trek ahead it was caught on Sky’s cameras for all to see, especially to the amusement of my family and friends who delighted in using sky+ to full use, rewind, play, rewind, play to the calls of “leave it alone!" I turned my phone onto Manx radio to get coverage, one headphone in, and Roger Black counted down with the crowd, 3….2…..1…. Go! I then had a surreal moment. I started, there seemed to be total silence and I could see nobody. For what was really a couple of seconds but seemed like weeks, I had the awful impression that I had set off on my own and over 1600 people were watching me hurry round the track while they stood on the start line watching me with utter bemusement. Then a feeling of utter relief as I saw Michael George out of the corner of my eye coming up on my left, and a quick glance showed that everyone was moving. For ten seconds or so, I was leading. Not my intention, but all plans I had up until then had vanished and I got drawn into Michael’s scheme. He was off at race walk speed and was dragging some of us with him. ﻿My inexperience was not doing me any favours, and I spent the next couple of hours keeping in touch with the early leaders, forgetting that the race is 85 miles, not 5 or ten. Michael Bonney e-mailed me an excel file later showing pretty much where I’d gone wrong. The “Too fast! !” was Michael Bonney’s comment, completely correct but about a week too late to be of any help. The average of 5.7mph to Rushen was the result of being dragged along with the leaders. 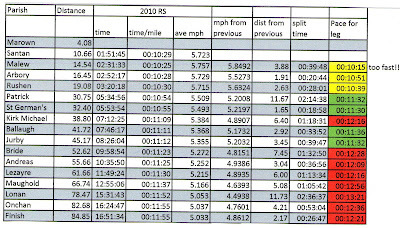 For the few weeks before, I had hoped that a sub 16 hour race was possible if everything went according to plan. 16 hours is another big milestone, finishing on the same day, the Saturday night instead of the Sunday morning. Everything had to go right. Unfortunately, it was at Rushen that Pauline’s car decided it wanted the afternoon off and chucked its clutch, totally unforeseen. Rushen before noon was the plan, and I was there at 11.20 so plenty of time to spare, and I was feeling good so set of at the same speed to take advantage of my good start and try and get as much spare time under my belt, unaware of my lack of support. I'd walked to Peel before in my first two Parishes but that was much slower burning far fewer calories and losing much less body fluid. The Parish is about a long day where everything has to go right when so much can go wrong. This was the first bad luck of the day for me.